The Jaffa Institute provides a hot, nutritious lunch everyday after school for over 200 impoverished children. Often, it is their only hot meal of the day. More than 200 children arrive at the doors of our After School Activity Centers every afternoon after school. The children all come from impoverished families and approximately 50% are in need of the Jaffa Institute’s emotional therapy program after suffering under the strain of an unstable home environment. The first thing they do when they arrive at our doors is eat a hot meal – often the only hot meal they receive that day. It is only after they are fully energized and nourished that the children are able to concentrate and fully benefit from the rest of the programming the Jaffa Institute offers. They remain alert during homework and tutoring time, able to retain information without the pains of hunger distracting them. They have the energy to play and expand boundaries, friendships, and personal growth during hours of play time, music lessons, or art therapy, all of which are provided by the Jaffa Institute. With only a single hot meal a day, there are significant changes in the demeanor of under-nourished children. Children who were sleepy, or could not sit still become much more attentive students and active participants. The Jaffa Institute was established in 1982 when our founders, Dr. David Portowicz and Col. Ze'ev Shaham opened the doors of our first After School Activity Center, Pahad Yizhak, to 15 impoverished, disadvantaged school children from the neighborhood. Since then, the Jaffa Institute has blossomed into a multi-faceted social service agency, offering more than thirty five programs to more than 4,000 impoverished individuals every year. These programs are spread out across 9 sites, including four After School Activity Centers, three residential facilities, and our Food Distribution Center. methodologies include animal therapy, arts therapy, garden therapy and shiatsu. the cycle of poverty for themselves and their families. and flourish in their own individual way. From food and tutoring assistance to emotional counseling, art therapies and preventative health care, we strive to provide the necessary elements for a safe and secure childhood. academic potential. The Hot Meal Program’s main goal is to ensure that the children in our care receive enough nourishment to be healthy, focus on their school work, and build emotional, mental, and physical strength. 1. The nutritional content of the food – do the meals deliver at least 30% of a child's recommended daily allowance of nutrients? The menu for the hot lunch program is evaluated prior to each school year by a registered dietician. Each meal contains at least on serving of a grain/bread, a fruit/vegetable, and a protein/meat. 2. How well the students like their meal – if the meals are not consumed or only half eaten, no benefits are derived. Consumption of the meals are observed by each group's counselor and assistant counselor and reported on to the Director of Programming. Our organization is unique in our experience and our subsequent flexibility in providing social services to impoverished individuals in Israel. The Jaffa Institute has proudly headed after school activity centers for almost thirty years. We have grown from a single site that welcomed fifteen impoverished children to multiple sites that, through a variety of programs, assists 4,000 individuals in their struggle to break free from the relentless cycle of poverty. We are well established in the field of offering social services like after school activity centers and food distribution programs and we have an excellent reputation in the community amongst those in need of our programs. Our established reputation also means that we have built and maintained excellent relationships with both local and national governmental offices, allowing us to more efficiently reach out to those most in need of our services. As a result of our experience in the field, the Jaffa Institute understands that the needs and demands of poverty are constantly evolving, shifting form as the population changes and as shifting factors contribute to a dearth of resources within our service area. It is for this reason that, we, too, have taken on a flexible form, evolving as the needs we address evolve. Unlike some organizations which remain static in their programming, the Jaffa Institute has adapted new programs and phased out obsolete ones as different needs arise. Currently, for example, we are building a Residential Campus in Afula in Northern Israel which will eventually be home to 200 at risk girls who have suffered from physical, mental, and emotional abuse in their family homes and have therefore been removed by social services. send home with Alon for his family. on the classroom's activities. However, since Jacob began attending Pahad Yitzhak, his teachers have noted a significant improvement in his schoolwork. Although he is still occasionally withdrawn and preoccupied, his grades are steadily improving and he now contributes in class. If youth are visiting Israel on a family vacation or organized class trip, we would love for them to visit us! We have volunteering opportunities in our Food Distribution Center, where teens get the opportunity to directly impact the community by packing boxes of food to be delivered to needy families. Youth can also come out to our After School Activity Centers to see the work of the Jaffa Institute first hand! They can spend the afternoon playing with our kids and help eout by putting a smile on their faces! 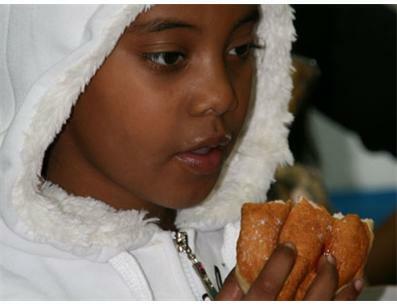 The first thing they do when they arrive at our doors is eat a hot meal – often the only hot meal they receive that day.